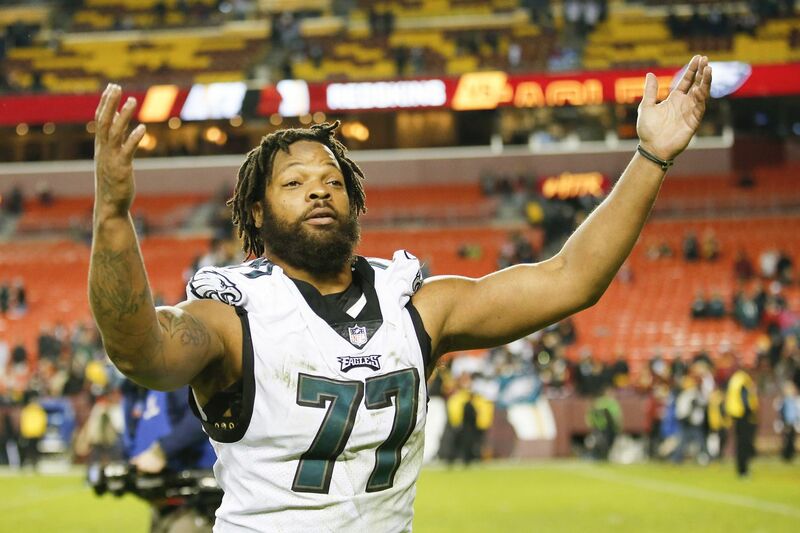 Eagles defensive end Michael Bennett waves after the Eagles beat Washington on Sunday, December 30, 2018 in Landover, MD. In November, the Eagles announced the creation of the Social Justice Fund, an initiative designed to grant awards to local community programs built on reducing barriers to equal opportunity. The entire organization gathered for the announcement, along with 12 selected members of the leadership council, who were listed by name on a poster. Seven players were chosen, including defensive end Michael Bennett, and five members of the Eagles' front office. What if current Bears backup Chase Daniel, not Nick Foles, ran the Philly Special for Eagles? “And Michael looks at the list, and this is in front of the whole organization, and he goes, ‘Why aren’t there any women of color there?’ ” Eagles guard Brandon Brooks recounted. You could hear a pin drop, according to Brooks. Outspoken is often the adjective used to describe Bennett. But that word, like the 33-year old, conjures up connotations that may be preconceived. Bennett is outspoken, but his outspokenness is multifaceted, depending upon the situation. In this instance, he was willing to make others uncomfortable because he saw a wrong that he thought should be righted, and one he feels passionately about – gender equality. In just 10 months with the Eagles, Bennett has made his presence felt on the field, in the locker room, and throughout the NovaCare Complex. Has he exceeded expectations? Maybe. But Bennett agreed that he has altered some opinions, in the building and in Philadelphia, about who is he as a person and as a player. “Perception is everything. I think people perceive what they want to believe,” Bennett said Wednesday. “Sometimes the way people see you because what you believe in or what you speak about, they tend to think that you’re not a nice person or something like that. Eagles defensive end Michael Bennett dances after sacking Washington quarterback Josh Johnson during the fourth-quarter on Sunday, December 30, 2018 in Landover, MD. There isn’t anyone quite like Bennett in the Eagles' locker room, nor has there likely ever been. He’s eccentric, beyond the tiny shoulder pads he wears on Sundays. His locker stall is probably the most cluttered at the training facility. A giant mound of cleats, clothes, and random paraphernalia, like a vintage Walter Payton “34” baseball cap, fill the floor space. A pair of suitcases randomly pop up outside his stall or lay open in the middle of the locker room. On his shelf is a mini-library of sorts that he hopes will spark the interest of other players. In front of the stack of books, just recently, was a figurine of an African American Santa Claus. Bennett often walks around the locker room with music – as diverse as Meek Mill or Pearl Jam or Patti Smith – blaring from a portable speaker. His clothes can be colorful and natty or drab and oddly matched. He’s impossible to miss. Negative? Perhaps not. But there was a perception, fair or not. He had been one of the more notable NFL players to protest racial inequality during the national anthem. He had been involved in an incident in Las Vegas in August 2017 when he was handcuffed by police in what he has said had been racial profiling. And just after the Eagles traded for Bennett in March, Houston authorities indicted him on a felony charge for pushing a disabled elderly woman -- an allegation he denies -- as he made his way onto the field following the 2017 Super Bowl. Eagles fans greet defensive end Michael Bennett during warmups before a game against the Washington Redskins at FedEx Field in Landover, Md., on Sunday, Dec. 30, 2018. Bennett can be thoughtful for minutes and then out of nowhere provocative. He has a natural sense of humor, and he gets this look in his eyes – call it a twinkle – when he’s about to say something outrageous. Joining a new team was uncomfortable for him. He’s spoken about the adversity of learning a new culture, playing with new teammates, and of initially having to play less than normal. But when starter Derek Barnett suffered a season-ending injury in October, Bennett’s playing time increased along with his production. It took a while, but the rest of the team caught up and now the Eagles are in the playoffs. Bennett maintained his level of play over the last month even though he played through a foot injury, finishing the season with nine sacks, 30 quarterback hits, and 15 tackles for losses. Last season, the Eagles won a Super Bowl with a cast of new players, some of whom came with bad reputations, like running backs LeGarrette Blount and Jay Ajayi. Brooks said that Bennett had also been unfairly branded by some. It’s hasn’t been a smooth road. Bennett and defensive line coach Chris Wilson had a few early sideline spats. And there have been some behind-doors confrontations, like the Social Justice Fund moment, that didn’t go over so well. But Bennett has had steadying advocates, like Jenkins and defensive end Chris Long, who have helped him assimilate into the Eagles, and what once appeared to be a one-year rental could turn into an extended stay. About three months ago, Bennett probably didn’t foresee a future in Philly beyond this season. He was still adjusting to life away from the Seahawks -- after five successful seasons in Seattle -- was coming off the bench, and was lining up more on the right side of the line. He was also trying to find his place within the team’s culture. In a New Yorker profile published last month, Bennett said that he had planned to stand beyond Jenkins and Long in the season opener during their anthem protest and raise his fist along with Jenkins in a sign of solidarity. He said he hadn’t told them. When the anthem began, however, Jenkins had his hands behind his back and Long had his hand over his heart. Bennett started pacing, sat on the bench, and near the end started tying his shoes. Since then, he’s mostly stayed in the locker room during the anthem. “If you play for a team for a long period of time, it’s just hard to, like, dig into that part of your soul, that essence of who you are to share your story or your concerns about people,” Bennett said. “Because it ends so fast and hurts so deep. It’s a sharp cut, but it goes deep into your soul. So it’s like, do you want to do that again? Bennett seemed to try. He developed an instant bond with Long, a fellow provocateur. During training camp, Wilson often gave him the floor once the X’s and O’s of defensive line meetings were over – teammates called it his “Farrakhan five minutes” – and Bennett’s pontifications would run the gamut. But he went outside his comfort zone, too. Rookie tackle Jordan Mailata had briefly met Bennett during last year’s Pro Bowl when the former Australian rugby player was training for the draft. When they met the next time, as teammates, Mailata reintroduced himself, but he said he was surprised when Bennett recalled their initial meeting in Orlando. Johnson said that many look at him as a redneck because of his appearance and Texas slang, and that he wondered if Bennett would dismiss him based on that perception. But, he said, Bennett took the opposite approach and engaged with him. When receiver Jordan Matthews rejoined the Eagles in September, he brought “Freestyle Fridays” – where players take turns rapping -- back to the locker room. Bennett was one of the few veterans to join in. He has said that he may enjoy mentoring younger players the most. Cornerback Rasul Douglas said that when he first spoke with Bennett, he was surprised by his voice. He had envisioned a deeper timber, because of the violent way he plays football, but the pitch was higher than he had expected. Bennett has also been a more vocal leader in group gatherings. He stood up before the Redskins game last week and addressed the defense, according to Douglas and Jenkins. But in casual conversion, whether with teammates or reporters, his exchanges can sometimes come off as performance art. He isn’t afraid to confront interviewers who ask questions to support a narrative. On Wednesday, someone had asked if he agreed with the message that other teammates had posted on social media about the Eagles taking advantage of their last-moment entry into the postseason. “I don’t look at social media,” Bennett said. He doesn’t post much original content on his @mosesbread72 Twitter feed, but he has been sharing a lot of material on his statistical success this season. Since Week 8, when Bennett’s playing time increased by 15 percent, he’s had six sacks, 10 tackles for losses, and 16 hits. He’s still, at 6-foot-4, 274 pounds, a handful for tackles, and when he rushes from inside, for guards, but a lot of his success is built upon preparation. In Seattle, his teammates used to call him “Coach” because of the amount of time he spent watching film. But all the prep in the world can’t supersede instinct. In last Sunday’s win over the Redskins, he thwarted a misdirection screen. In Dallas last month, he diagnosed a zone-read run and dropped Cowboys quarterback Dak Prescott for a loss. He has an innate ability to read plays and people, and his response may be shocking. “I like to surprise people because they come in with preconceived notions about you,” Bennett said. But his renowned outspokenness, that’s just who he is.